Human trafficking is one of the cross-cutting issues. It is a worldwide serious concern. Human trafficking is an illegal trade of human beings for sexual exploitation, forced labour, extraction of organs or tissues and so on. According to the United Nations Office on Drugs and Crime (UNODC), human trafficking is the recruitment or transportation of persons by means of the threat or use of force or other forms of abduction, fraud or deception, or for the purpose of exploitation. It knows no gender, age, race and boundaries. Victims are trafficked within a country or transnational. They are smuggled because they are forced to work as prostitutes, domestic servants, beggars, factory workers, mine workers, circus performers and child soldiers. It is like another form of slavery. The majority of trafficking victims are women and children because of marginalization in many societies and their limited economic resources. Besides them, other key target group include people from low income households, ethnic minorities, illiterate or people with low level of education, refugees, illegal migrants, children running away from home, and other members of split families are also prone to it. Women of forced marriage and early marriage, deserted wife, widows and discriminated daughters are easily victimized. a. Human trafficking is a ............... problem because it is prevalent all over the world. d. ............... are mostly victimized because they are marginalized in societies. e. Divided family ............... are also likely to be trafficked. a. Why were people jealous of Kanchhu’s family? b. What made the grandmother feel that she was ignored? c. Why couldn’t Dinesh’s parents talk about each other’s problems last night? d. Why did the father not want to be bothered? e. Who does the boy think the most responsible for his grandmother leaving home? a. People were jealous of Kanchhu's family because it was a happy family. b. The grandmother felt that she was ignored as every member in the family had no time to talk to the grandmother. c. Dinesh’s parents couldn't talk about each other’s problems last night because the father was busy at his business, where as the mother had to prepare some documents on the computer. d. The father wanted not to be bothered because he had to handle many things. e. The boy thinks father and mother are the most responsible for his grandmother leaving home. The WWF Media in Conservation Award was established in 2007 and recognizes the transformational roles of media persons/organizations in highlighting conservation issues in Nepal. The role of media, whether print or electronic, is increasingly playing a key role in spreading the message of conservation. To encourage promising media persons and organizations in Nepal, each year WWF gives away this award to an individual or organization that best supports the value of conservation through their groundbreaking and inspiring work. The recipients of the WWF Conservation Awards are selected from the nomination received by an independent selection panel that comprises an eminent group of people and experts. The awardees receive citations and cash prizes-NRs 25, 000 for individuals and NRs. 50,000 for organizations. c. A person receives a prize of NRS .........................if he/she wins the award. 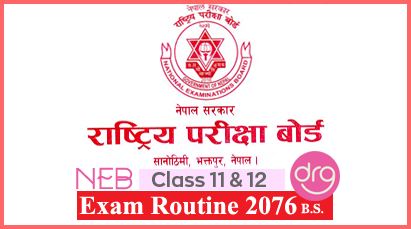 d. The last date of ...................... submission is 19th August, 2013.
e. Applicants should submit their documents in .................... copy. a. Who can apply for the award? b. What is the main aim of the award? c. Who selects the awardees? d. What are the two things the winners receive? e. What is the website of WWF? a. An individual or an organization working in conservation can apply for the award. / An individual or an organization can apply for the award. b. The main aim of the award is to encourage promising media person or organization. c. The selection panel selects the awardees./ An independent selection panel selects the awardees./ Eminent group of people or experts selects the awardees. d. The two things that the winner receive are citation and cash prize. The weather gets colder, days get shorter and leaves turn color and fall off the trees. Soon, winter is here. Snow covers the ground. People live in warm houses and wear heavy coats outside. Our food comes from the grocery store. But what about animals? Animals do many different, amazing things to get through the winter. Some of them "migrate." This means they travel to other places where the weather is warmer or they can find food. Many birds migrate in the fall. Because the trip can be dangerous, some travel in large flocks. For example, geese fly in noisy, "V"-shaped groups. Other kinds of birds fly alone. How do they know when it is time to leave for the winter? Scientists are still studying this. Many see migration as part of a yearly cycle of changes a bird goes through. The cycle is controlled by changes in the amount of daylight and the weather. Birds can fly very long distances. For example, the Arctic tern nests close to the North Pole in the summer. In autumn, it flies south all the way to Antarctica. Each spring it returns north again. Most migrating birds travel shorter distances. But how do they find their way to the same place each year? Birds seem to navigate like sailors once did, using the sun, moon and stars for direction. They also seem to have a compass in their brain for using the Earth's magnetic field. Other animals migrate, too. There are a few mammals, like some bats, caribou and elk, and whales that travel in search of food each winter. Many fish migrate. They may swim south, or move into deeper, warmer water. Insects also migrate. Some butterflies and moths fly very long distances. For example, Monarch butterflies spend the summer in Canada and the Northern U.S. They migrate as far south as Mexico for the winter. Most migrating insects go much shorter distances. Many, like termites and Japanese beetles, move downward into the soil. Earthworms also move down, some as far as six feet below the surface. Geese move from place to place for food. Arctic tern usually move towards south. Whales migrate in large groups. Fish shift below the earth surface. Monarch butterflies are found in the north in hot weather. Termites can travel very long. live in northern US in summer. Arctic tern=are found in the north in hot weather. Whales=move from place to place for food. Monarch butterflies=live in northern US in summer. Termites=shift below the earth surface. a. Write any two things people do to feel warm in winter. b. Apart from finding better weather, what other thing do animals migrate for? c. What are the scientists studying for? d. What direction do the Arctic birds move in autumn? e. How do birds find the right way? f. What do most of the breast-feeding animals migrate for? g. Who can fly a great distance? h. How deep can earthworms get into the soil? a. People live in warm houses and wear heavy coats to feel warm in winter. b. Apart from finding better weather animals migrate for food. c. The scientists are studying to know how birds know the time to migrate. d. The Arctic birds move in autumn to/towards south. e. The birds find the right way using the sun, moon and stars. f. Most of the breast-feeding animals migrate for food. g. Insects/ moths and butterflies can fly a great distance. h. Earthworms can get 8 feet deep into the soil. a. I am always interested in learning new things, aren't I? b. My uncle did not pass away last year. c. How long did it take for me/you to complete this task ? d. When I reached there, he had just left. e. He said to me," Did you see him yesterday?" f. A beautiful garden was grown in their backyard. A cat remained hungry for a number of days. He…(1)….. (is growing/was growing/grows ) thin day by day. One day, he learnt that one of the birds of the neighboring house …(2)…… (was/were/is ) sick and the birds were looking for a doctor. The hungry cat devised …(3)…. (a/an/the) way to manage his hunger. He got someone …(4)……(fetch/to fetch/fetched) a doctor’s gown and wore it. With a doctor’s bag he went to the sick bird’s house. The doctor cat gently …(5)…..( knocked/was knocked/had been knocked) at the door. The birds peeped out through the hole and enquired about the reason for his visit. In a very kind and humble note, Mr. Cat said , “I’m your neighboring doctor. I heard that you ...(6)…. (are not/were not/will not be) well ..…(7)… (so/because/although ) I have come to treat you.” As you know a doctor’s duty towards his patients is above everything ,…(8)…( isn’t that/isn’t it/aren’t they)? The birds were far smarter than the cat. They smiled cleverly and replied,” Thank you …..(9)... ( for/with/by) your kind gesture!” Had you not been a cat , all your utterances …..(10)…(would be/will be/would have been)absolutely right. And now, we can expect our wellbeing only when you are out of sight. 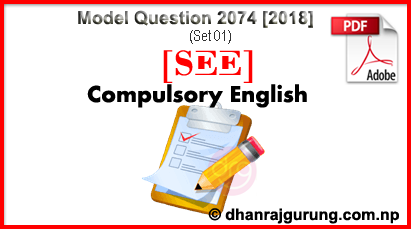 0 Response to "English Model Question | 2074  | SET 01 | SEE "